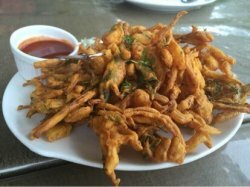 Onion Bhaji - my kids attacked this dish as its a starter. They loved it so much they even ate their deep fried curry leaves that was in it! Hubby said this was like extreme Muruku. Onion strips with Muruku coating! Must eat there, fresh and crispy! 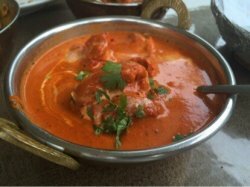 Butter Chicken - buttery and creamy and just delightful. My girl was practically drinking the sauce! Mutton Tikka - they didn't have it on their menu but this is a FAVOURITE dish of my hubby's and their chef very generously said yes. So they made that dish specially for him. It was also another hit with my children. Even I was impressed. I have tried many others and theirs was really one of the better ones. Rogan Josh - lamb chunks cooked in spicy curry. I swear mutton is not the easiest meat to handle and they do it right! And the curry sauces are seriously distinct from each other but still oh-so-yummy!!! 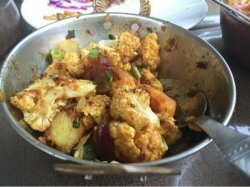 Aloo Gobi - I was slightly disappointed when I saw their it was quite dry with no sauce. But the taste just knocked my socks off. Seriously one of the best Aloo Gobi I have eaten. I could finish bowls of this! 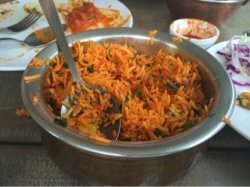 Chicken Biryani - this was served in this deceptively small bowl with lovely spiced rice and tenderly cooked chicken chunks. My girls LOVED the chicken in this dish. And after many spoons of rice was eaten, the bowl still looked kinda half full!! Hub and I was so full after we finished the rice but no regrets there. 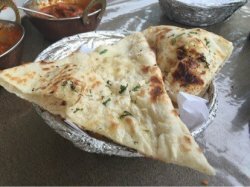 Butter and Garlic Naans - this was another great dish. We ordered 2 first and then had to top up with another naan. Evident that my girls were just packing the naans away!! !